The far-left turn of the Democrat party has reignited an ideological debate here in the United States that I have not seen since the Cold War. It has always existed in Europe, in part because the far left is much stronger and deeply entrenched in their political landscape, but Americans have not been exposed to unmitigated radicalism from the left for at least a generation. Even then, the exposure came in the form of a foreign threat - from the Soviet Union to Cuba - and never really seemed to find a domestic foothold. That radicalism has now made landfall, and a big splash. The forcefulness and dangers of this so-called New Socialism cannot be overstated and must not be under-estimated. As I explained two weeks ago, in reference to a great article by Pat Buchanan, the new socialist agenda would explode our already-large welfare state, adding single-payer health care, universal basic income and general income security (starting with paid family leave), tuition-free college and universal child care. I have also, in a previous article, explained how the left would pay for this: to avoid having to raise taxes on lower income and middle-class families, they would simply take to the monetary printing presses. Disguised under a pseudo-scientific acronym (and a joke of a "theory") called MMT, the Bernies and Ocasios of this world would follow in the footsteps of their great economic leaders like Joseph Stalin, Robert Mugabe and Hugo Chavez. Just like their ideological heralds flooded their economies with increasingly useless cash, the crop of New Socialists here in America will take over the Federal Reserve and use it - literally - as their in-house bank. The effect, of course, will be exactly the same as in other socialist countries: currency destruction followed by hyper-inflation. It will take a while for them to push us to the million-percent inflation that has engulfed socialist success stories like Zimbabwe and Venezuela, but we will get there. However, along the way there - while prices are only rising by 50, 500 or 5000 percent per year - they will destroy everything else they can get their hands on. Their method will be to hollow-out, but not formally do away with, private property. Again, this is their method. It is not their goal. It is important to understand that socialism is not about taking people's property - it is about eliminating economic differences between private citizens. The devaluation or termination of property rights is only a means to that end. If Americans in general do not learn this distinction - the means and the ends of socialism - they will misunderstand the enemy within this country. (Yes, socialism is an enemy to the United States of America, ideologically, culturally, economically, constitutionally, philosophically...) So far, safe for the aforementioned piece by Pat Buchanan the efforts to beat back the New Socialist onslaught has been inadequate in this respect. The New Socialists thankfully do not stress the old theme of abolition of private property through the collective ownership of the means of production. So what do they believe? Under capitalism, we're forced to enter the market just to live. The libertarian sees the market as synonymous with freedom. But socialists hear "the market" and think of the anxious parents, desperate not to offend the insurance representative on the phone, lest he decree that the policy she paid for doesn't cover their child's appendectomy. Under capitalism, we're forced to submit to the boss. Terrified of getting on his bad side, we bow and scrape, flatter and flirt, or worse - just to get that raise or make sure we don't get fired. The socialist argument against capitalism isn't that it makes us poor. It's that it makes us unfree. Epstein counters this point by contrasting East and West Berlin during the Cold War. Explaining the stark contrasts between these two parts of the same city, one under socialism and one under capitalism, Epstein clarifies the practical consequences of putting into policy the delusion that capitalism makes us unfree. I get the picture Epstein is painting. I, too, walked along the Berlin Wall back in the day. It was one of the most formative experiences of my life. It topped off a summer traveling in Soviet-run Eastern Europe; there was no better way to put on full display what a live-size prison socialism eventually becomes. Today, the best contrast that anyone can get is probably to shuttle between Seoul and Pyongyang. Or, maybe, between Chile and Venezuela. people will really discover what it means to be unfree when they only have this choice: work for the state and spend your falling wages on government-supplied goods - or starve. And to whom does the unhappy citizen turn when there is only one healthcare provider, one landlord, and one education system? The crassly minded socialist would counter by pointing out that there will be numerous landlords and health care providers - they will just all be under the thumb of government. They will be taxed and regulated to a point where they can neither make money nor maintain good service without violating a government dictate. From there, the debate would likely continue into the night, revolving around where to draw the line for government ownership. Again, socialism is not about private property. It is about economic redistribution. Full-scale egalitarianism. As I explained in my book The Rise of Big Government: How Egalitarianism Conquered America, the ideas of egalitarianism have already made deep inroads into the U.S. economy. Starting with the War on Poverty in 1964, Congress has institutionalized egalitarian thought by fundamentally rewriting the purpose of the federal government: back then, half of all federal spending went to the military; today, that share is less than 15 percent. By contrast, almost seven dimes of every federally spent dollar goes toward economic redistribution. The New Socialists want to expand government in that same direction. It is this point that Corey Robin conveys when he laments the American worker's dependency on a boss: so long as you have to rely on your workforce participation - a job, for short - to make a living, you will always have a boss. By portraying the relationship between the employee and the boss as akin to servitude, Robin tries to tell us that New Socialism will provide us all with what we need without expecting us to work. The formal meaning of this is: a package of entitlements, cash or in kind, that allow us all to put food on the table, have a place to live, get clothes and other necessities, and health care and education, without ever having to work a day in our lives. Robin reinforces this political pipe dream with his reference to a private health-insurance plan that denies a claim. Which brings us to a point about the socialist entitlement promise that socialists never talk about. All you get under a government-run entitlement state is a long list of promises. You are promised food, shelter, health care and so on. Actually getting any of what you are promised, is a different story. Just as an experiment, try get health care in today's single-payer systems. Interestingly, socialism has not always been solely about entitlements. There have actually been systemic thinkers even among the left, people who understood that you have to somehow actually provide the goods and services you promise people. The old-school thinkers on the left, intellectual giants like Gunnar Myrdal and John Kenneth Galbraith (again, see my book referenced above), understood that the satisfaction of needs requires industrial production - and yes, services are also industries - and that this industrial production must happen in an orderly, predictable fashion. Myrdal and Galbraith were open about their support for various forms of central economic planning. They had elaborate theories for how to make that happen, some of which have been put to work in Europe in general, and Sweden in particular. Since I have spent several previous articles on the slow-progressing economic disaster zone that is my native country, I will not repeat my main points here; see the link at the bottom of this article for reference. However, it is important to note that even if those old-school socialists were highly trained economists and accomplished thinkers, their conclusions about how to run an economy were terribly wrong and have - to the extent implemented - contributed to the economic decline of the West. The scary part of this, though, is that the new generation of socialists are far from the sharp minds of their predecessors. Having lost the ability of erstwhile socialists to think systemically, the Corey Robins of our time only look at the end goal: the complete eradication of economic differences between individual citizens. Those among their ranks who try to think economically - such as Bernie Sanders chief economic pundit Stephanie Kelton - resort to unhinged monetary printing as a means to finance socialism, simply because they fail to grasp the complexities of a modern, industrialized economy, capitalist or socialist. In other words, the immediate problem with socialism is not its disastrous consequences for private property. With no pun intended, that disaster is only collateral damage. The real disaster is in the effort to break the unbreakable ties between work and reward. Where more people are promised more, fewer people will have an incentive to work. Since fewer people work, fewer people make a living and more people depend on government promises. Yet when fewer people work, fewer people provide the goods and services that government needs for its entitlement programs. This is where the socialist dreamland turns into the same live-size nightmare that both Richard Epstein and I saw at the Berlin Wall: a country turned into a prison. Once socialists have completely decoupled work from reward; once they have destroyed the practical meaning of owning property in the name of economic redistribution; once product shortages and rationing proliferate through the economy, from clothes and shoes to health care and food; once they have destroyed what is left of the price mechanism by money-printing us into hyper-inflation; there is only one option left. In the Soviet empire, there was no unemployment. It was illegal to be unemployed. People who refused to work were sent to the Gulags. But that is a topic for another day. For now, let us separate the means and the ends of socialism, so that we can fight it effectively. For more on socialism in Sweden, check out my three-part series that starts here. Europe is an irredeemable mess of industrial poverty where stagnation and decline will dictate the future for generations to come. Sadly, though, it is not the only scene of imploding prosperity: with Japan in perennial stagnation and Canada following about a decade behind Europe, the United States of America is left as the last vestige of liberty, capitalism, entrepreneurship and opportunity. That hold-out, however, is in grave danger, and the reason is not just that our nation's leftist cohorts have decided to cross the the last line of sanity. We also have a serious problem with Republicans whose commitment to the prosperity-destroying welfare state is almost as strong as that of the left. Thanks to the neoconservatives in the Republican party, the parallel lines of conservatism and liberalism in American politics have almost merged into one statist track for our nation to follow. We still have not gone all-out Scandinavian in our pursuit of the welfare state, and thanks to that we are still outperforming Europe in terms of economic growth. However, that is not much to cheer about; your boat is still sinking, even if the hole in it is smaller than that on the Titanic. Until Congress starts making the necessary reforms, we will continue to follow in the footsteps of the declining welfare states in Europe and Canada. The core of the problem is the idea that government both can and should reduce economic differences between individual citizens. It should do neither, but that point continues to fall on far too many deaf ears in our nation's capital. Nevertheless, even if we tolerated the premise that government should reshuffle income among the American people, it is an inescapable fact that the U.S. economy is in no need for such measures. Government has done quite a job of it already. The distribution of income is, namely, already more flat than it is often portrayed to be. The 60 percent of households that have the lowest incomes have seen their money grow largely within a narrow bracket. The upper income groups have taken off substantially, but the difference in growth was only becoming pronounced after the 1990s. That was, notably, the last time the U.S. economy exceeded four percent annual growth. Since the Millennium Recession "the 60 percent" have largely experienced a stagnation in their inflation-adjusted incomes. It is here that many advocates of income redistribution get the fuel for their arguments favoring more egalitarianism. However, a closer look reveals that things are not nearly as dramatic as they look. In fact, those who want more income redistribution as a desperate solution to raise the standard of living for lower-income Americans are - to brutally fuse metaphors - clamoring for the straw that will break the camel's back. 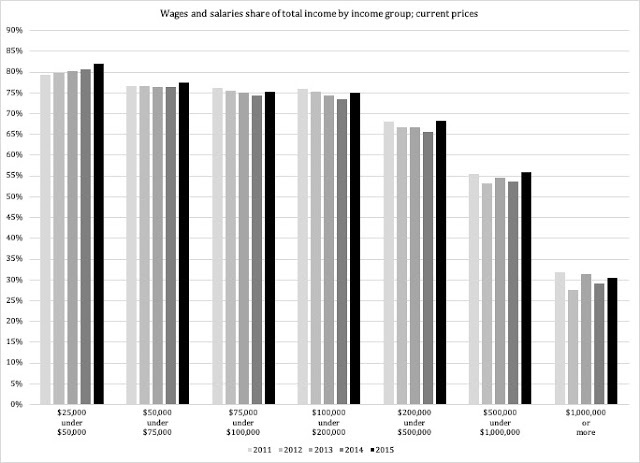 Since high-earning households do not qualify for the plethora of entitlement programs available for lower income households, it is reasonable to assume that the reason why the highest-earning 20 percent have pulled away, is that they earn a substantial share of their income from equity. Without detailed data on the composition of their incomes over time, we cannot isolate exactly how their earnings would have fared, had they not seen strong growth in stock dividends and other investment-based income. However, it is reasonable to assume that the performance of the large amounts of liquidity that have been pumped into the U.S. economy over the past 20 years - especially since 9/11 - have fueled the stock market in particular, to such an extent that it has allowed wealthier taxpayers to pull ahead. 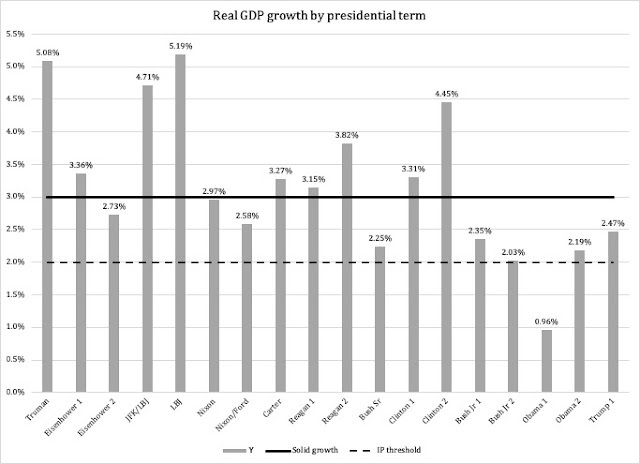 Not a single presidential term has managed to reach three percent growth, on average, since Bill Clinton was in office. As a consequence of 2-2.5 percent growth, needless to say work-based income slows down as well. The situation was not helped by the depressive performance of the Obama administration and the deeds of the Democrat majority during the first half of his first term. However, that was only the low-mark of an economy that has been dragging its feet for 20 years now. All while its political leaders have dragged their knuckles along the gravy-soaked floor of Capitol Hill, focusing more on the politically expedient and ideologically convenient than the nation's economy. It concentrates the tax burden to the upper income layers, with the 20 percent that make the most money paying approximately two thirds of all federal taxes. 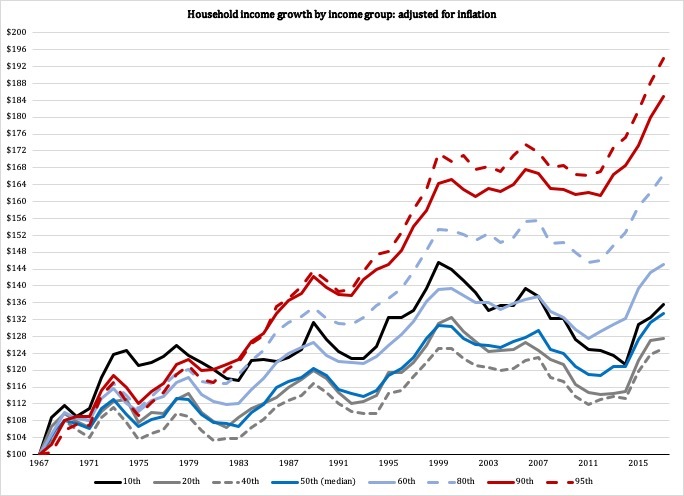 Slow growth traps more people in the entitlement-eligible income layers, while starving government for tax revenue. Slow growth also erodes work-based income, making higher earners more dependent on equity-based income. This, in combination with the tax base being concentrated to the highest income groups, effectively makes the welfare state dependent on the stock market. At the heart of this problem is a ticking fiscal bomb: the budget deficit. It continues to grow thanks to insufficient GDP growth; the Trump tax cuts bought us a bit more time but we are already running out of steam from it. What we really need is a flat personal income tax combined with substantial, fiscally sustainable reforms to all non-defense federal spending. Let us hope the Republicans come around in larger numbers, realize what they need to do on the spending side and stand up for their vision. There are grains of hope in their Congressional leadership; much more is needed. The European economy is stuck in a state of perennial stagnation. Its political leadership shows no signs of understanding the nature of the problem; if anything, they are bound to make it all a whole lot worse. Before Republicans in Congress move forward with their plan for paid family leave, they should take a look at the Swedish experience. There, the pendulum is swinging in the other direction, and it is not because of some sudden ideological awakening. The reason is much more sinister than that. How much more evidence do we need that big government causes both slow growth and budget deficits? This article reviews economic data from Europe for the time period 2001-2017, showing that small government is good for growth, austerity is bad for growth and deficits are caused by the welfare state. What if the Democrats win all across the board in 2020? Short answer: the gates of the Venezuelan Hell will open up right here, right in the middle of the American heartland. Don't believe me? Keep reading. The federal budget deficit is well known, as is the larger-than-GDP debt. With the OMB predicting a trillion-dollar deficit as early as this fiscal year, our nation's indebtedness is approaching the unsustainable at breathtaking speed.